For more than 80 years, ExxonMobil and its predecessors used rail to move oil products from the Fawley refinery, but all traffic ceased in September. Nick Lera charts the history of this Hampshire industrial site. BORN of the oil industry and now discarded by it, the 9½-mile Hampshire branch from Totton to Fawley has stopped carrying refinery traffic; ExxonMobil has turned its back on a railway that was essential to Fawley’s operations for more than 80 of its 91 years. A railway down the eastern side of the New Forest by Southampton Water was first planned in 1872 when the Swindon Marlborough and Andover Railway sponsored an Isle of Wight extension, terminating on the Solent at Stone Point, near Lepe, with a ferry to Cowes offering the shortest possible sea crossing. However, insufficient capital was raised, and despite periodic attempts to revive it the scheme foundered. Even a 1906 pioneer motor bus service failed in 1908 due to poor roads that weren’t improved for another 10 years. Then, shortly after the First World War, the establishment of an oil refinery on the western shore of Southampton Water changed everything. The Anglo Gulf West Indies Petroleum Corporation (AGWI) was formed in 1920 and acquired a square mile of marshland at Fawley. Site clearance started in 1921, materials and plant being brought in over a 2ft-gauge tramway from Ashlett Quay, half a mile to the south, using small petrol tractors. However, this conduit was inadequate for future needs, leading to pressure to revive the old Stone Point railway scheme as far as Fawley. The newly named Totton, Hythe & Fawley Light Railway was duly authorised in 1922, with AGWI and the LSWR as major shareholders. On August 8, 2016, DB Cargo’s No. 66124 passes under the signal gantry at Marchwood with crude oil from Holybourne to Fawley. The driver has given his loco a home-made headboard slightly prematurely named ‘Fawley Finale’, but we are grateful to him for giving us a title for this article. Marchwood at 86.15 is the junction for the MoD port at Cracknore Hard, on Southampton Water, which will keep this part of the Fawley branch in business for the foreseeable future, especially if potential lessee Solent Gateway develops a civilian side, which could generate new rail traffic. Manual signalling predominates, almost unique on Network Rail in southern England these days. Construction started in spring 1923, the contractors being Sir Robert McAlpine & Co Ltd. With steam shovels discharging into tippler wagons on a 3ft-gauge light railway, excavation spoil from Marchwood and Hythe was used to make a bank across Dibden Marsh and the single track from Totton (82.42 miles from Waterloo) to Fawley (92.05 miles) was finally ready for inspection on July 8, 1925. Public passenger trains started on the 20th. Intermediate stations were at Marchwood (86.15 miles) and Hythe (89.13 miles); there were 10 public road crossings, while bridges over and under totalled nine. Hythe and Fawley had small goods yards. The Southern Railway, as successors to the LSWR, assumed control of the TH&FLR during its construction and provided small station buildings somewhat lacking in charm, but serviceable enough. There were passing loops at Marchwood and just south of Hythe. A 70-yard spur to AGWI’s boundary on the east side of Fawley station led to the refinery’s sidings and a further half mile of standard gauge track served by its own petrol tractors. The 2ft-gauge line to Ashlett Quay was closed when the new SR connection was opened, but narrow tracks continued to serve installations within the refinery. The passenger service to Fawley was somewhat sparse; just three return trips, with a long gap during the day when refinery staff were at work. Former LSWR ‘O2’ class 0-4-4T locos, with short rakes of Brighton six wheelers, were the order of the day. Freight traffic continued to grow and in the 1930s 0-4-2 tender locos of the ex-LSWR ‘A12’ class became standard on the branch, being a suitable maid-of-all-work for goods and passenger, the crews liking them for the good view ahead over their low tenders. No turntable was ever provided at Fawley. In 1926 Anglo-American Oil took over the refinery and expanded and improved it, the company introducing the enduring Esso brand name in 1934. Upon the outbreak of war in 1939 it was decided to mothball the plant; it was deemed too inviting a target for the Luftwaffe, which predictably bombed it several times. They only hit a few storage tanks, as essential refining installations had been transferred elsewhere, out of range from Germany. After D-Day (June 1944), Fawley briefly became part of the PLUTO (pipeline under the ocean) project to supply Allied forces in Normandy via the Isle of Wight, but there were technical problems and when the Calais region was captured PLUTO was switched to Dungeness. Railway traffic as far as Marchwood increased after a siding to Cracknore Hard was laid in 1939 for harbour defences. It was expanded to a full-blown military port in 1943, the slipway becoming a major assembly point for Mulberry floating harbour sections in the following year. In late 1945 the original Fawley refinery was reinstated and resumed its pre-war production levels. 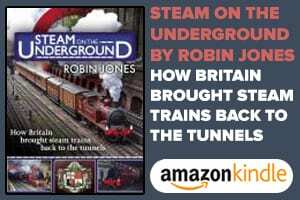 However, its output made far too small a contribution to Britain’s bankrupt post-war economy, which lacked the foreign exchange to pay for the large amount of refined petroleum that still had to be imported. The answer lay in a five-fold expansion of the Fawley site by Anglo-American, on the west side of the railway, on the 100ft-high Cadland Estate, overlooking Southampton Water. Some 3,000 acres of hillside, fields and marshland were acquired from the Drummond family, lords of the manor for nearly 200 years, their 46 bedroom mansion on the heights becoming temporary offices for Esso after spending the war under military requisition. It had been a country club since 1935, the family having moved to Lepe, near Stone Point, on the Solent. No risk of disturbance from a new railway there, the old Isle Of Wight extension being long forgotten. The contractors moved in as soon as land purchase was completed in 1949, and the first task was construction of a standard gauge loop line, three-quarters of a mile long, on a gradient of 1-in-46, to connect the extended Fawley sidings with the high ground, where the modern refinery was to be built. The newest type of diesel-powered excavator was used to cut a swathe through Cadland’s 18th century Capability Brown parkland in as short a time as possible. As soon as track was laid, a General Electric 45-ton 0-4-4-0 diesel electric, imported new from the USA, began taking trainloads of steelwork and plant up to the extensive two-square-mile site, also hauling a ‘dido’ of two old passenger coaches for the construction workers. Meanwhile, assorted SR locomotives would appear on freights down in the new 800-yard long sidings, renamed Cadland Yard. 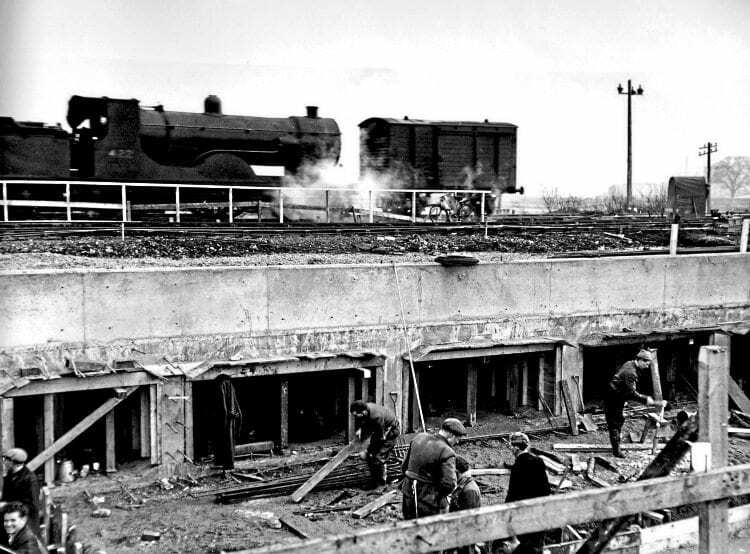 Some were on works trains for track laying, others servicing the building of culverts under the railway for pipelines to the new marine terminal on Southampton Water. The project was massive, involving a workforce of 5,000 men, with 70 American engineers supervising the refinery construction, which covered 1,000 acres on the hill site alone, and was carried out during Britain’s wettest winter for 60 years. Rainfall in October 1950 was 7.96 inches, but nevertheless the new plant was completed ahead of time and was already in full production by the time of the gala opening by Prime Minister Atlee on September 14, 1951, in perfect accord with the spirit of progress engendered by the contemporary Festival Of Britain. Fawley now provided 20% of the nation’s refining capacity, a figure maintained to this day; quite an achievement considering the growth of the UK’s economy in the intervening 65 years. 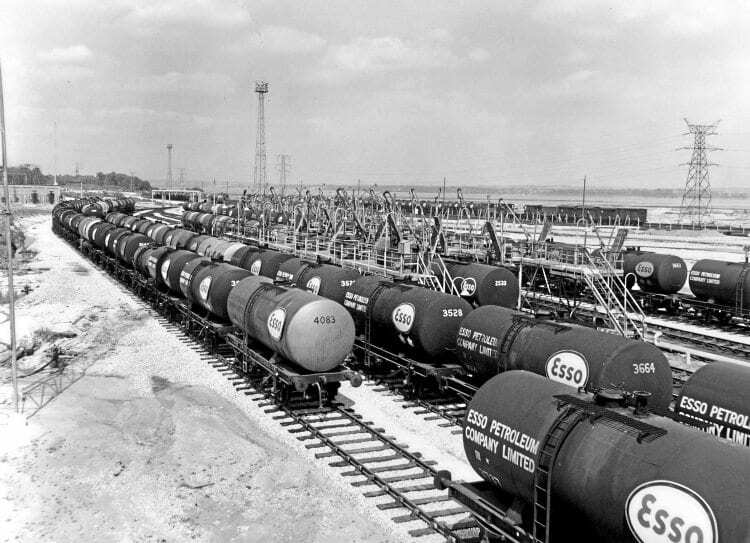 With the extended marshalling yard, the AGWI lines, and the new ‘Cadland Heights’ link line with multiple spurs to loading racks, the refinery’s railway system now totalled 3½ miles. Rail traffic was intense, round-the-clock shifts being worked as loaded tank wagons were marshalled for despatch all over the South and West. In the 1950s, loose-coupled freight was still the norm on BR and this applied to petroleum wagons too. An ex-LMS Stanier type guards van of 1945 was acquired to control unbraked loaded tank wagons descending the steep curve down to Cadland Yard. In the mid-1950s an outpost of Fawley was created at Hardley, three-quarters of a mile up the SR line at MP 90.75, where surplus ex-Cadland Estate land was leased to Monsanto for a synthetic rubber plant and Union Carbide for a chemical factory. The first had its railway siding at MP90.75 and had a single-road loco shed, while at MP 90.5 another siding was laid in to serve Union Carbide. A typical Fawley loco outstationed here would be a Rolls-Royce Sentinel 0-4-0 diesel bearing a Railway Executive registration plate, permitting transit of BR track. All Hardley traffic was tripped to/from Cadland Yard – only Down BR freights called. These sidings, together with one for a new chlorine-loading rack in the main refinery, near Gate 1, on the Hardley Road, brought Esso’s track mileage close to four. Hardley was served by a new Southern Region passenger halt from 1958 to 1965. It didn’t appear in the public timetable, but all trains called there. The Fawley branch must have held the record for steam motive power variety. After the old ‘A12’ 0-4-2s had gone in 1949, there seemed no regular steam locomotive type for the Fawley branch. Just about anything Eastleigh happened to have in steam turned up at some stage: 0-6-0 700 ‘Drummond Motors’, ‘L11’, ‘L12’, ‘Q’, and ‘Q1’ were regular visitors until 1951 when drivers’ objections to tender-first running were accepted. Almost every type of tank engine was tried: ‘Z’ 0-8-0T, BR Standard Class 2 and 3 2-6-2T (often in pairs), ‘M7’, ‘E4’, ‘E6’, GWR 0-6-0PT, the list goes on. There was even a sighting of a little Adams ‘B4’. Arriving from London in spring and summer 1960, the powerful ‘H16’ 4-6-2T were the favourites at Fawley, coping best with the 1-in-183 grade northward through Hythe, being virtually tank versions of the Urie ‘S15s’; but they were missed back in Feltham, which reclaimed them in July 1961. A welcome interlude in steam days was the occasional school excursion, examples being a trip from Fawley to Windsor in 1959, double-headed out of Fawley by a GW 0-6-0PT and a Class 2-6-2T, and another likewise in January 1961 to see the Bertram Mills Circus at Olympia in London. The last steam was the ‘W’ 2-6-4T, effectively tank versions of the ‘N1’ 2-6-0, their 10-month tenure ended by Type 3 (Class 33) ‘Crompton’ diesels from May 1962, hauling Bromford Bridge fuel trains throughout, and very soon taking over the rest of Fawley’s workings. The familiar loco changes at Totton, Millbrook or Eastleigh were now no longer required. The Cromptons’ reign was a long one, Class 37, 47, 56 and others appearing from the 1980s onward, while from around 2000 Class 66 predominated. The meagre passenger service, which never improved (except for a workers’ morning extra in 1949), was latterly worked by a Hampshire DEMU, and ended altogether in 1966, public freight to Fawley following a year later, from which time scheduled traffic south of Marchwood was only for Esso. Freight volumes soared, with some trains running at night. Marchwood’s passing loop was extended and an extra loop with a new signalbox was put in on the south side of Frost Lane in October 1960. The variety of Esso’s rolling stock is reflected in a snapshot of the tankers observed in Cadland Yard one day in 1979 (see footnote below). The following products each had their dedicated wagons: fuel oil, diesel, gas-oil (aka red diesel), aviation spirit, methanol, refined petroleum (two grades), paraffin (‘Esso Blue’), bitumen, solvent, LPG, caustic soda, and naphtha, the last named being sent to many gas works to boost production of town gas when the coal industry started its decline. The naphtha traffic ended abruptly when natural gas from the North Sea came on stream from 1976. The heyday of Fawley’s rail traffic was brought to an end by the development of the UK’s oil pipeline network. Fawley to the Midlands opened in 1987, replacing the Bromford Bridge trains, earlier pipelines having already replaced, for example, the tankers of aviation spirit that used to serve Gatwick airport, and the weekly diesel fuel train to Marylebone. Motorways and new link roads further eroded rail-borne volumes. Pipeline use needs high volume so some of Fawley’s facilities were shut down, notably the two factories at Hardley, whose production loss was balanced by specialist expansion elsewhere in the ExxonMobil group. The passing loop and signal box at Frost Lane were taken out of use in November 1980. Already the future of the line to Fawley was being called into question, but the Falklands War in 1982 brought a spike in traffic volume to MoD Marchwood, creating capacity issues on the rest of the Fawley line due to closure of the Frost Lane loop, and night working had to be temporarily reintroduced. Development of new oilfields at Wytch Farm in Purbeck and Humbly Grove near Alton also provided a stay of execution. With no nearby pipelines, their growing output provided a fresh source of rail traffic, and new crude oil discharge racks were built on the West side of Cadland Yard. However, as more new pipelines with multi-product capability took their toll on the volume of outgoing rail traffic the specialist tanker loading racks at Fawley were progressively de-commissioned so that by 2000 the former key link in Esso’s internal rail system – the 1-in-46 hill climb to the refinery – was virtually disused. The last ‘top site run’ (as it was known) occurred in 1999 when despatch of chlorine by rail ended. 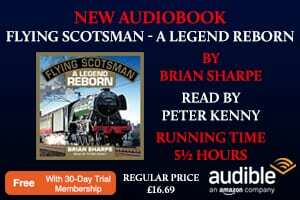 The six diesel shunters that had once worked round the clock shifts now had little to do and the older ones were sold off; there were no customers for the LMS brakevan, which was last seen on site in 2008 in a derelict condition. By 1987 the tonnage of crude carried to Fawley by the new block trains exceeded that of refined product being railed out. The last survivor of the era of wagon-load traffic was the well-known 6V62 tanker train to Tavistock Jct, followed by many enthusiasts, and likened by some to the old ‘Atlantic Coast Express’. Setting out from Fawley with an impressive convoy of miscellaneous products, it took a roundabout route via Westbury, dropping off at Bristol and other key points in the West and South West, including BR diesel loco depots, and wound up at Tavistock Jct in Plymouth sometimes with just one vehicle. The loco would then backtrack along the route, picking up the empties along the way – even less economic than the old ACE, which at least had a return load. Reduced to twice a week, with some calls omitted, 6V62 ended as a weekly ‘Q path’ working, not always making it as far as Plymouth. It last ran in 2013. Another late survivor was 6M23 bitumen tanks from Fawley to Washwood Heath, which ended in 2009. In August 2016, shortly before the end of rail traffic, the author obtained permission to visit Fawley and observe the single remaining shunt duty handled by one of two 0-6-0DH locomotives still on site. In colour liveries, matching their names, Bluebird (HE8998/81) was the working engine, while Redwing (HE8999/81) was in the single-road shed, on standby. 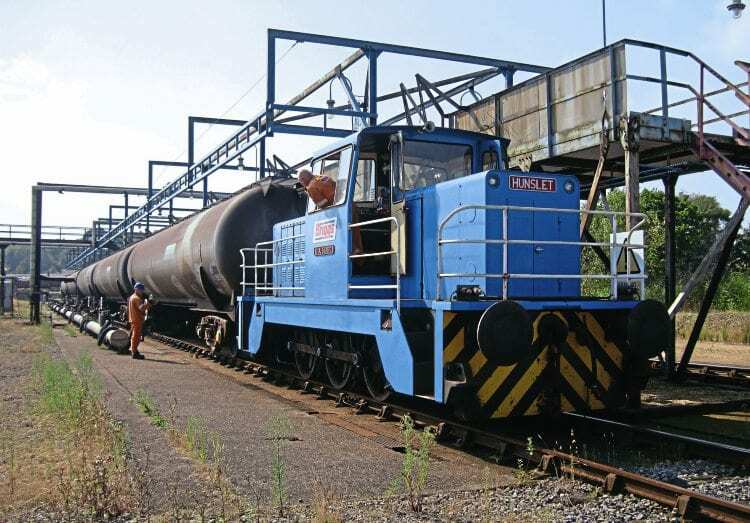 They were classic examples of the Hunslet rod-drive design of industrial diesel shunting locomotive for home and overseas, built from the 1970s until 1988 in four-, six- or eight-coupled versions, in 4ft 8½in, 3ft 6in, or metre gauges. Fawley’s final pair were the 450hp model, powered by a 14-litre GM Detroit type 71N unit with a tractive effort of 40,000lb at starting, and 25,000lb at 4mph. After Esso’s mechanical workshop closed they reverted to Hunslet’s ownership upon overhaul in Leeds in 2007 and 2008, being leased to Esso thereafter. 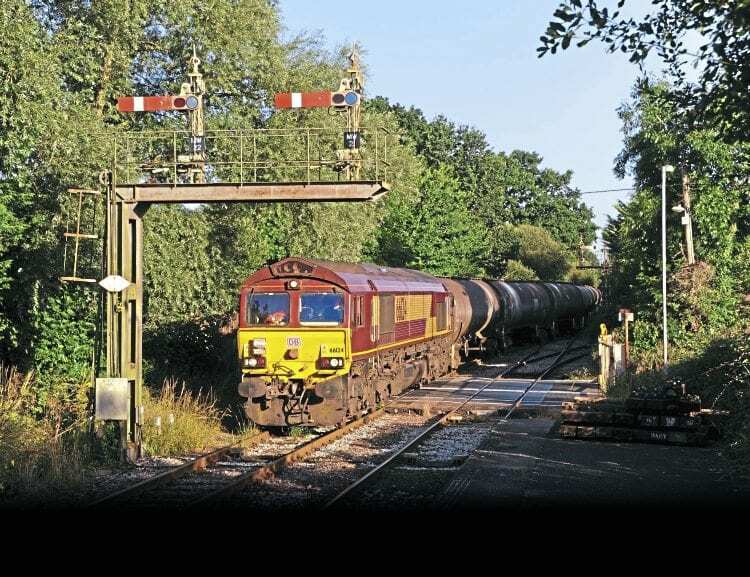 When Fawley ceased product despatch by rail in 2013 the only remaining traffic was incoming crude from Holybourne, Hants, in the Carless oilfield. Three times a week, but latterly only twice, ten 70-ton-capacity oil tank wagons would arrive at Fawley, hauled by a Class 66 diesel, which then ran light back to Eastleigh, returning for the empties the next morning. All Bluebird had to do was split the bogie tanker rakes of crude into two cuts of five and back each one into the parallel five-car unloading racks. Next day the empties were re-marshalled as a rake of 10 and propelled into the old SR station ready to be hauled back to Holybourne by a Class 66. This meant Esso’s loco was used for just two or three hours a day Monday-Thursday, the few rail operations staff being assigned other duties to make up their working week. Loco hire with staff, upkeep of the track and fixed oil installations for the sake of just 1,400 tons of oil a week had become a loss maker for Esso, which on August 4, 2016 announced they would stop accepting rail-borne crude from August 25. The actual last delivery was on September 1, an event duly recorded by BBC TV for its South Today programme, which reported that Holybourne’s rail-borne input to Fawley formed less than 0.5% of the refinery’s workload and was therefore not viable, all crude intake and most product output now moving by ship or pipeline. 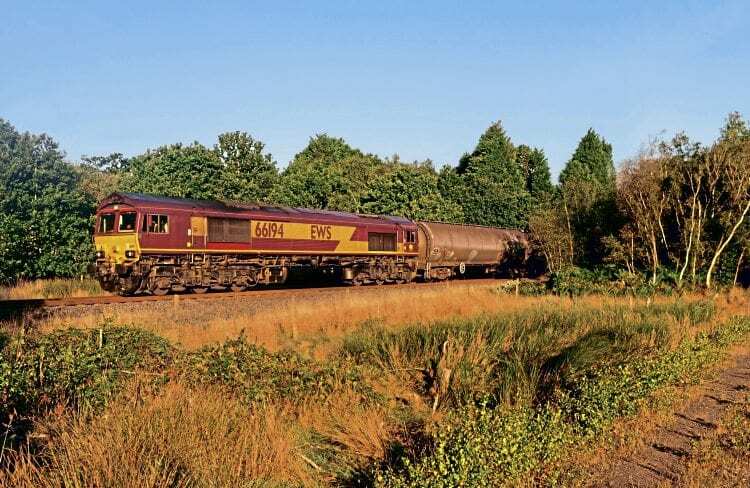 The last DB Cargo train at Fawley ran on September 5 when the empty bogie tankers were returned to Holybourne (RM October, p84), their further deployment uncertain at the time of writing. Esso’s lease on Bluebird and Redwing expired on October 31; their next move will be on low loaders back to the Hunslet Engine Co.
Other refineries, notably Immingham, still make substantial use of rail, but the southernmost limit of scheduled petroleum trains in the UK now seems to be Theale, near Reading, supplied from Milford Haven. Military traffic continues to Marchwood Port, but prospects for the six miles on to Fawley now seem bleak, especially as a promising Metro Rail scheme, named the Waterside Railway, as far as Hythe (three miles south of Marchwood), was indefinitely shelved by Hampshire County Council in 2014 despite strong local support and a good commercial case put up by business interests. In short, the council would subsidise either local buses or the railway, but not both. With their long record of service to the community dating back to the infamous nine-hour gap in the train timetable, the buses won the day. Network Rail, however, continues to maintain the track to Fawley, pending a final decision over its future; an MPV rail cleaner was observed at Hythe in early October. Meanwhile, legal discussions are taking place as to who owns which rails and the land they rest on within the secured Esso complex, whose high metal fencing and guarded gates have since 2000 totally enclosed the last three-quarters of a mile of the ex-SR Fawley branch with the station and its former public access road off Marsh Lane. 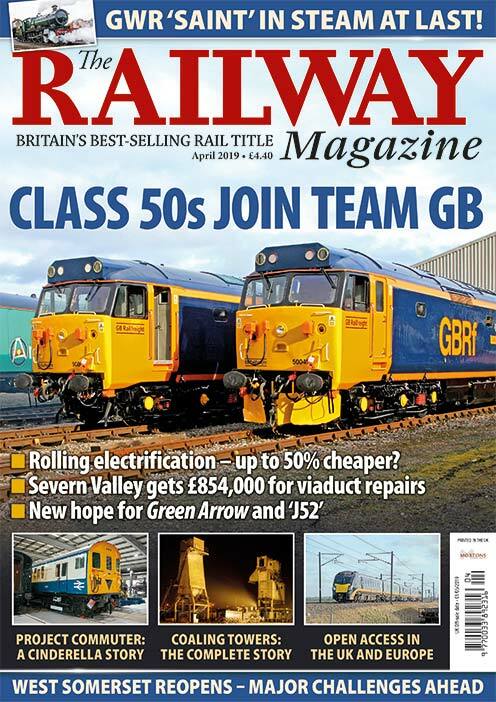 Read more News and Features in the August issue of The RM – on sale August 2!